Betfair Sports received a score of 90/100. 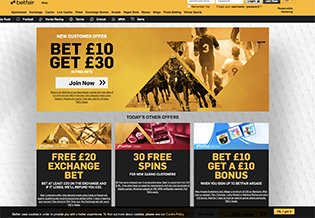 Betfair Sports and the Betfair Exchange, where punters can become the bookies and invite others to lay bets at odds they set, is one of online gambling’s remarkable success stories. From humble beginnings in the UK they have now become the world’s biggest and arguably best betting exchange and sportsbook. They have huge liquidity across hundreds of betting markets, meaning you can pick out an online bet on pretty much any event in any sport at any given time and someone will be offering you odds. Betfair was formed in the UK in 2000 by Andrew Black and Edward Wray. By 2006 it was valued at £1.5 billion. In 2010 Betfair floated on the London Stock Exchange. Then in 2016 the company merged with Irish online bookmakers, Paddy Power, to form Paddy Power Betfair in a deal reported to be worth around £7 billion. As a customer of Betfair you can be sure of a world class gambling experience, with a full site that includes all the betting markets, plus a casino, bingo and poker, as well as a top-notch betting app giving you instant access to the Betfair exchange, sportsbook and all markets. Betfair is licensed from the Gibraltar Gambling Commissioner and the UK Gambling Commission. You can join Betfair right now and claim £30 in free bets when you make your first deposit and bet. Or read on for our full review of all the services provided by Betfair. First time at Betfair? Then treat yourself to a £30 free bet when you make your first deposit and make your first £10 bet. This offer is only for new customers, and only applies if you deposit by credit or debit card, or using Paypal. Make sure you use Betfair bonus code ZSK200 when you make your deposit. Further conditions are that you must lay your £10 bet on a sportsbook market with odds of 1:2 or greater. Exchange bets do not count and your bet must be placed within 30 days of regsitration on the site. If you win with your free bets then the bet itself will not be returned, only your winnings will be credited to your account. At time of writing should you wish to you could choose instead to opt for a 25% cashback up to £250 offer on your first 30 days of bets on Sportsbook or Betting Exchange. To take up this offer you would have to register using promo code, EXC25L. With Betfair Betting customers are treated to a range of promotions every week. Here is a flavour from those available at the time of writing. 20% Bonus on Acca Edge Profit: Acca Edge is a unique insurance system developed by Betfair that gives you money back on accumulators of 3 or more where only 1 team lets you down. Unlike other sportsbooks Acca insurance, here it applies for trebles and more, rather than 5 or 6 results or more. In this promotion, get a 20% profit boost per week on any bet placed on Acca Edge. Maximum bet is £25. Risk Free £5 Bet on Betfair Exchange: When you place a £5 or more bet on the Exchange in any given week, if you lose you get a £5 refund. This is for new exchange customers only. Best Odds Guaranteed on UK and Irish Horse Races: If the national Starting Price odds are better than Betfair’s Sportsbook, then Betfair will pay out at the national odds. Simple as that! As a top tier world class online bookmaker, Betfair offer an incredible range of sports markets. You can browse the entire seletion across the top of your screen in the full site mode. The most popular sports are displayed by default, but just click on All Sports to get the full list. Everything is there from American Football to Darts, Pool, Hockey and Volleyball. As you would expect from a company the size of Betfair, a few alternative markets are also offered, including TV Specials like the winner of Love Island, Big Brother, or Sports Personality of the Year. There are also currently bets on when or if Donald Trump will be impeached, and the name of Will and Kate’s third child. You will also find by digging into the markets that the range of options is huge as well. So, if football is your choice for example, you are not restricted to just the English leagues, but can choose to bet as far out as Chinese, Icelandic, or even Peruvian football. The Betfair in play betting market range is also wide. At time of writing at 3pm on a Wednesday there were no less than 68 live events with options for In Play bets, including Finish Football friendlies! There is also a Betfair Live Streaming service, open to all customers, although for horse racing enthusiasts you must first have placed a £2 or more bet on any given race in order to watch live coverage. Other sports, including Football and Cricket, are free for all members to watch. 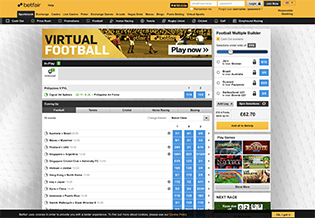 The Betfair full site features the recognisable yellow and black branding that we all associate with this online bookmaker and exchange. Finding your way around is quite simple, though unlike many sportsbooks, Betfair choose to display their markets navigation across the top of the screen on desktop rather than down the side. In fact, the left side navigation panel is reserved for Quick Links to the most popular current events and markets. This actually makes for a cleaner design and it feels easier to read the center panel with your chosen market. Across the very top of the screen you can access all Betfair’s alternative products, including Casino, Bingo, Poker and Exchange. Betfair have developed a sophisticated app to allow customers to access their sportsbook and exchange whilst on the go (or on the couch!). To access the app you must first have an account - Sign up today and get £30 in free bets. The Betfair app allows you to do everything you could possibly need to do, from your phone. So you can access all the markets, place bets, cash out bets, deposit and withdraw funds from your account, bookmark your favourite markets, check the live scores section and look for the most popular current bets as recommended by the Betfair team. The app is available for iPhone and Android and can be downloaded in seconds from the Google Play store or the Apple store and works really well on both tablet and handheld devices. Punters who like a bit of casino or bingo play on the side will love the Betfair Casino, which runs on the Playtech platform. This means the site offers a massive range of top quality slots games, including the brilliant Marvel Slots series that includes titles like The Incredible Hulk, Superman and Batman and Cashwoman! There are also some great iconic titles like Age of Gods, and big Progressive Jackpots that include Jackpot Giant, Chests of Plenty and Gladiator Jackpot. For bingo players, Playtech are again the software suppliers, which means a really sophisticated product that allows you to play networked, nation-wide jackpots alongside your standard free and paid for regular games. A full range of deposit and withdrawal options is provided in the Betfair Cashier. So that includes standard Visa, Mastercard, Mastro, and Cheque, alongside eWallets including Neteller, and mobile banking option, Skrill. Paypal, Western Union and Click and Buy are also available. The pending time for withdrawals can be up to 72 hours, which is a little longer than other sportsbooks. Thereafter, credit and debit cards may take up to 5 days, and eWallets up to 24 hours to process. The Betfair Customer Support team can be reached in many ways. Launch their Help Center from the bottom of the screen at any time and you’ll find a big selection of FAQs, as well as a Live Chat function with a 30 second waiting time, and also email and telephone support. You can also contact the team via Facebook and Twitter. Betfair complies with UK online gambling regulations and is licensed both by the Gibraltar Gambling Commissioner and the Uk Gambling Commission. This means that Betfair Sports complies with the high standards needed on issues of fairness, security and trust.